In a bowl, whisk together the ingredients for the zesty orange dressing and set aside. 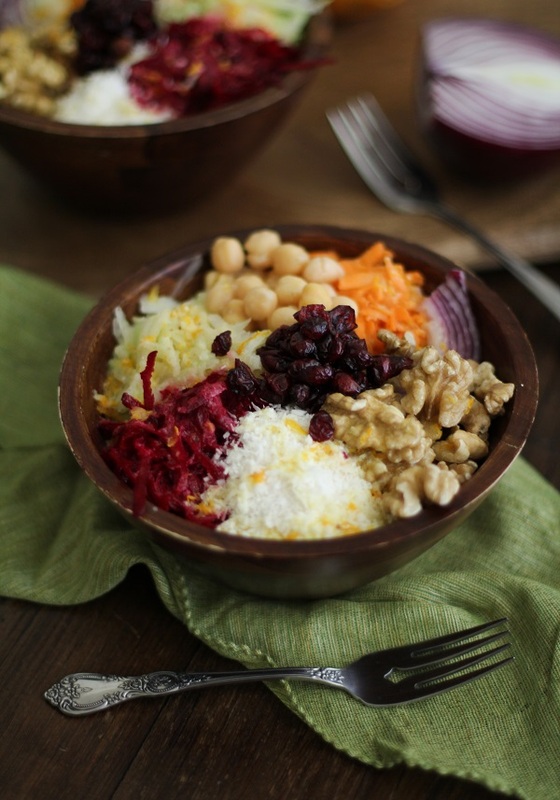 Add desired amounts of each of the ingredients to a bowl and pour desired amount of dressing on top. Note that you can serve these bowls over a bed of spring greens or cooked rice, and can also add a variety of optional add-ins, such as chickpeas, avocado, and/or hard-boiled egg. In order to make this into root vegetable slaw, simply combine all of the ingredients (excluding the optional add-ins) into a large bowl. Pour the zesty orange dressing on top, and mix together until well-combined. You can use this slaw on sandwiches, in salads, on top of fish or poultry, or serve as a side dish.